In the depths of winter we enjoy finding winter color. Here then is a Grand Canyon Railway train parked at the rim of the Grand Canyon (which is just beyond the treeline) in 2008. Run by the Xanterra company (renamed from the Fred Harvey Company), a huge operator of resorts, its classic railroad we all miss I suspect. As I have noted elsewhere perhaps the Fred Harvey expertise will be called upon to put restaurants in or near Amtrak stations if the Republican looney toon bean counters have their way and food on long distance trains is eliminated or reduced to those gawdawful hamburgers a la grease they serve in cafe cars. At the very least we have to hope that a Western run isn't captured by bunch of anti-government subsidy wingnuts, having been captured in Washington by them already. Its afternoon commuter time in Lisle, Illinois, in September 2006, and Metra trains on the BNSF main line make for a happy pair. This photo is part of a good news-bad news situation. 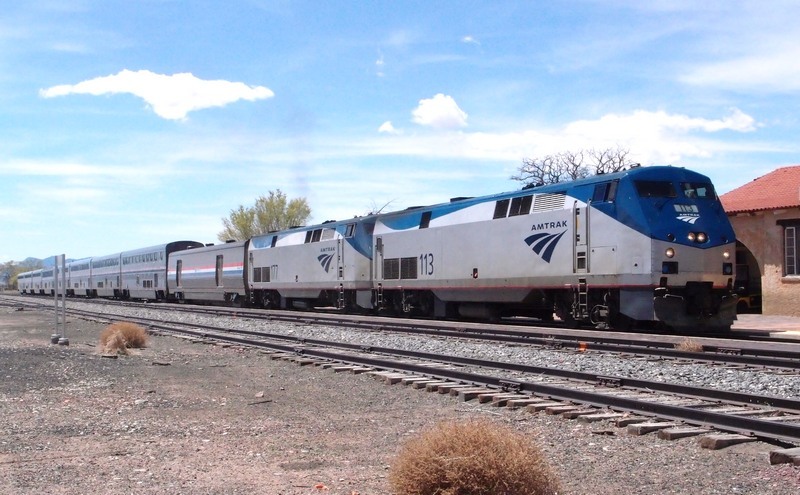 The good, I should say very good news, is that towns in New Mexico, Colorado and Kansas have saved the route of the Southwest Chief, seen here arriving in Lamy, NM, on Thursday, April 14, 2016, on its way from Los Angeles to Chicago. Right on time. Spotless. A perfect example of how public and private interests can band together to save a much-needed mode of transportation after its host freight railroad announced that it would have to change its route due to changes in freight routing that would abandon much of its current one. The bad news is that the once popular Santa Fe Southern tourist line between Santa Fe and Lamy has been closed down, taking some of the glitter off the Railyard District of Santa Fe. The New Mexico Rail Runner Express between Santa Fe and Albuquerque has faced some financial challenges, but continues to run. Lets hope that Amtrak bean counting and rather stupid Congressional oversight will not cut into what is clearly an optimistic development. 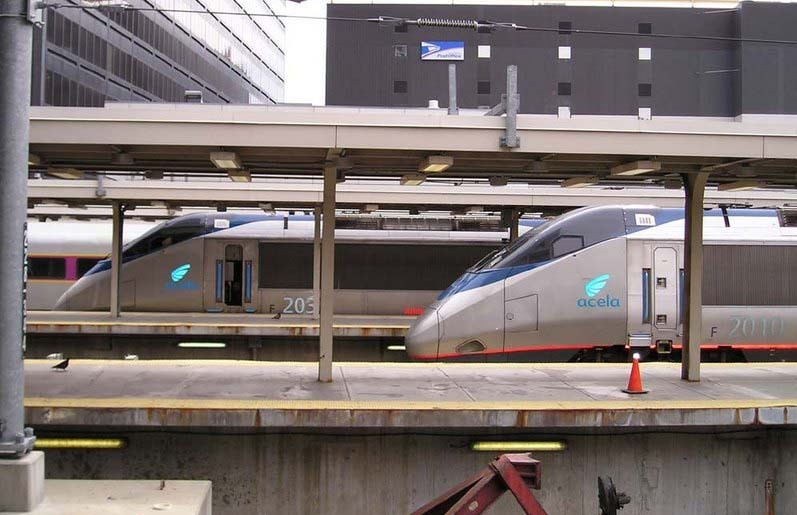 We celebrate with a photo of Acelas parked at Boston South Station in August 2004. As I write this Amtrak and the MBTA are in some kind of financial conflict around maintenance and signalling costs which has Amtrak threatening to cut service to and from Boston. Those of us who live in Massachusetts aren't particularly surprised about any possible mess concerning the MBTA...and expect somebody will pay a price for sorting this out. Changes last made on: August 29, 2016.